...that irukan is a grain consumed by Sangheili? This article has one or more disputed facts. Please visit this article's talk page for more info, and clean this page so it meets wiki standards. "Well it’s a grenade, innit? It blows up." The M9 High-Explosive Dual-Purpose grenade (M9 HE-DP) is the standard-issue hand grenade of the United Nations Space Command. The weapon is semi-erroneously known as a fragmentation grenade and the colloquial frag. Furthermore, the M9 designation technically refers to several models of varying design. Like most UNSC small arms and explosives, the M9 is produced by Misriah Armory. A blueprint of the M9 in Halo: Reach. The grenade has a hard metal casing, with a frangible design meant to break apart into small, regular shards. This surface creates consistent, reliable fragmentation patterns for the grenade, rather than randomly rupturing along metallurgical faults. The grid-shaped casing houses a charge of ComL high-explosive fitted with a mechanical primer. When the charge detonates, it shatters the grenade's casing, sending shrapnel flying away at high velocity. In all Halo games, the grenade must first hit the ground before exploding. In Halo: Combat Evolved, the grenade would not detonate mid-air. In Halo 2 and Halo 3, it would bounce and explode mid-air a moment after bouncing. But in Halo 3, if the grenade was thrown up, and hit a surface going up, it would not explode until it hit the ground. This is a safety feature, ensuring the grenade would only explode after striking a surface after being thrown, and not in the user's hand. This may explain the lack of a "spoon", or handle, on the Halo 2 and 3 M9 HE-DP grenades. The spoon is a device that is gripped while the grenade is being primed. It ensures the grenade will not explode until after the spoon is released, as it starts the fuse of a grenade as it flies through the air after it is thrown. In Halo: Combat Evolved, the spoon would have negated the need for this Halo 2 safety feature. In Halo: Combat Evolved and Halo 2, four of these grenades may be carried at a time. This was reduced to two in Halo 3 due to the presence of four grenade types, but increased to three in Halo 3: ODST; in Halo: Reach the player is again able to carry only two grenades. This grenade can be effectively hurled and bounced around corners and travels farther than the Plasma Grenade; this can be used to quickly and aptly damage an attacker before he can move away from it, giving you an instant advantage in the close combat situation. It is also harder to see and has a shorter fuse, therefore making it harder to avoid and more useful for killing enemies on foot. In Halo: Combat Evolved, it also seems to have a larger blast radius than a Plasma Grenade. It has the largest casualty radius than the other grenade types in Halo 3. Also, since it is harder to see, having an enemy run over one by accident can happen more easily than with a bright blue plasma grenade. Unlike the Plasma and Spike grenades, this grenade does not stick to objects or opponents. It has more of a chance of wounding a player than killing them because an unwounded player has to practically crouch on the grenade to be within the kill-radius. The grenade cannot kill a fully shielded Sangheili, Spartan, or Jiralhanae, unless they are touching it. It can, however, kill a partially shielded opponent in a single hit. In stark contrast, the Plasma Grenade is a one-hit kill if stuck or lands nearby so players have to be careful when throwing. In the Halo: Combat Evolved campaign, if one grenade is caught in the blast of another, it will be set off; this can lead to massive chain reactions if large numbers of grenades are scattered around the battlefield. However, grenades that were originally spawned on the map will not detonate, only the ones that are dropped by enemies and allies that are killed. A similar effect is found in the Halo 2 campaign, however since the grenades are less powerful these chain reaction explosions are less dangerous and less likely to occur. Smoke comes out when you throw it, so enemies can easily see and avoid it if they are fast. The M9 HE-DP Grenade is best used when enemies gather together in tight groups. A well thrown grenade placed in the middle of a Covenant lance will kill most of the Grunts and damage an Elite's shields. With the shields damaged, players can easily kill the Sangheili. In addition, frag grenades should also be used against a group of Jackals, as their defense shields will not protect them from the blast. In Halo: Combat Evolved, the only Elites that can be killed with one detonation are Stealth Sangheili, with its downgraded shields. The M9 HE-DP Grenade is also commonly used against light-armored vehicles. A multipurpose weapon, the fragmentation grenade can be used in corridors, to flush out occupants. The blast will severely damage player's energy shields allowing for easy follow up attacks. One frag grenade is considered as either aid in combat for quick damage before the fight starts, or as a tool to finish off an unshielded opponent. 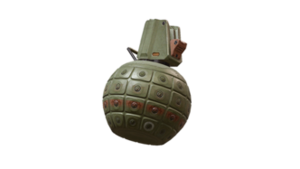 A grenade can be bounced off of a wall to ambush an enemy or kill your ambushers. Two frags is where this grenade becomes a killer all on its own. The first takes out the shields, the second finishes them off. If timed correctly, grenades can be planted in the path of an oncoming vehicle. Most drivers will not be able to react quickly enough, and will most likely be caught in the blast. Lighter vehicles will be easily flipped by concussive blast, and a heavily damaged vehicle will oftentimes simply be destroyed. Another good multiplayer tactic is to throw one at the player's feet while back-pedaling when an enemy is charging at the player. When the grenade detonates, the other person should be in the blast radius of the grenade and have their shields damaged or be killed. This is useful to fight oncoming vehicles, preferably light-armored vehicles like Ghosts, Mongooses, or Warthogs. Frags are also very handy to kill opponents when used in conjunction with explosive objects. Destroying Fusion Coils or Plasma Batteries with a grenade means the grenade's damage plus the explosive's damage would hurt or kill the target more effectively than a single frag grenade. The fragmentation grenade is also a good finishing tool since it is powerful enough to take down a spartan's shields, without the user being in line-of-sight of their target. Use an automatic weapon (Assault Rifle, Plasma Pistol/Rifle, SMG,) to take down their shields then throw the grenade at the person's feet once your mag is empty or overheated for the finishing blow. "Grenades are not something you throw just because you see bad guys. Make sure you know where your squad is at, make sure it’s only the bad guys you’re gonna blow up, then chuck the damage." "This is my third tour and I’ve seen action on a half dozen planets—I’ve also seen about five different versions of the M9. Not like em nine eh through em nine ee, but totally different fragmentation grenades called em nine. I guess that’s one of the consequences of being part of a galactic empire [laughter] I said galactic empire!" "The grenade detonated directly beneath the Ghost and sent it and the driver tumbling through the air; the remainder of 1st squad dispatched the Brute and secured the enemy vehicle." "...bounced off of the loading ramp and exploded above head level (2.4 meters) killing the Brute SL and disrupting the remaining Grunts." "Well it’s a grenade innit? It blows up." Frag grenades will not bounce when it lands in snow or sand, making them more deadly on Snowbound, Sandbox, Avalanche, and Sandtrap. In Halo 2, Halo 3, Halo 3: ODST, Halo: Reach, and Halo 4, players can shoot grenades out of the air, causing them to explode prematurely. The best weapon for this is the Battle Rifle (or the DMR in Reach). In Halo: Combat Evolved, the Frag Grenade is smaller when in use than when it is inactive. In Halo 3, it is possible to deflect rockets with a Frag Grenade explosion, similar to the Gravity Hammer deflecting a rocket. However, this is extremely difficult to pull off, so it is not a recommended tactic. In Halo: Reach, grenades lying in the ground can be shot to injure nearby enemies. Grenade impacts also do damage to targets before they detonate. It takes the impact damage of 58 grenades to kill a fully shielded player. In Halo: Reach, the Frag grenade produces a deafening effect on nearby players for several seconds and is much bigger than in previous Halo games. In the Halo: Reach Multiplayer Beta, the Frag Grenade had a larger explosive radius, causing the community to compare them to "little tactical nukes" or "Holy Hand Grenades". The overall damage level was reduced back to the standard of the Halo 3 Frag Grenade in the final product. In both Halo: Spartan Assault and Halo: Spartan Strike, the grenade explodes on impact with hostiles. Detail view of an M9 Frag Grenade in Halo: Combat Evolved. A pair of M9 grenades from Halo: Combat Evolved. The M9 Fragmentation Grenade in Halo 2. The M9 Fragmentation Grenade in Halo 3. A profile image of Halo 3's fragmentation grenade. A fragmentation grenade in mid-flight. The M9 Frag Grenade as it appears in the Halo: Reach Beta. The M9 Fragmentation Grenade in Halo: Reach. An overview of the M9 Frag Grenade from Halo: Reach. Front and back views of the M9 Frag Grenade from Halo: Reach. Left and right views of the M9 Frag Grenade from Halo: Reach. Reference chart of the Fragmentation Grenade in Halo: Reach. A comparison of the M9 Fragmentation Grenade models from Halo 3 and Halo: Reach. Render of the M9 grenade in Halo 4. The M9 Fragmentation Grenade in Halo 4. HUD Icon of the M9 Frag Grenade in Halo 4. The M9 in Halo 2: Anniversary.